First up today were some of the “office dogs”, Chihuahuas and other smaller dogs who live in individual cages next to the main entrance instead of in the big wings with the big dogs. 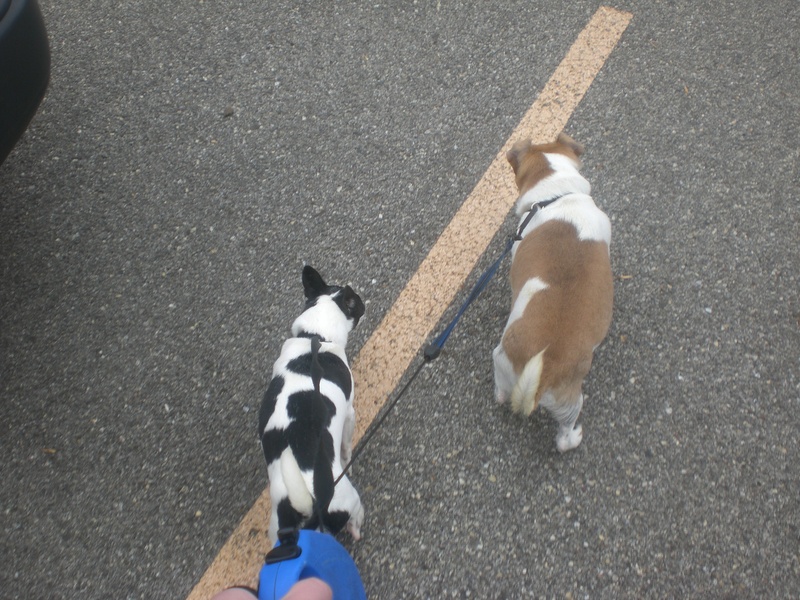 Even little legs need exercise, so I took three of these dogs for walks around the property. Mink and Puggie work well enough together that I could take them both out simultaneously. Mink is incredibly precious and very friendly; when he was let out of his cage, he came right up to me and put his front paws on my leg so I could reach down and scratch his ears. 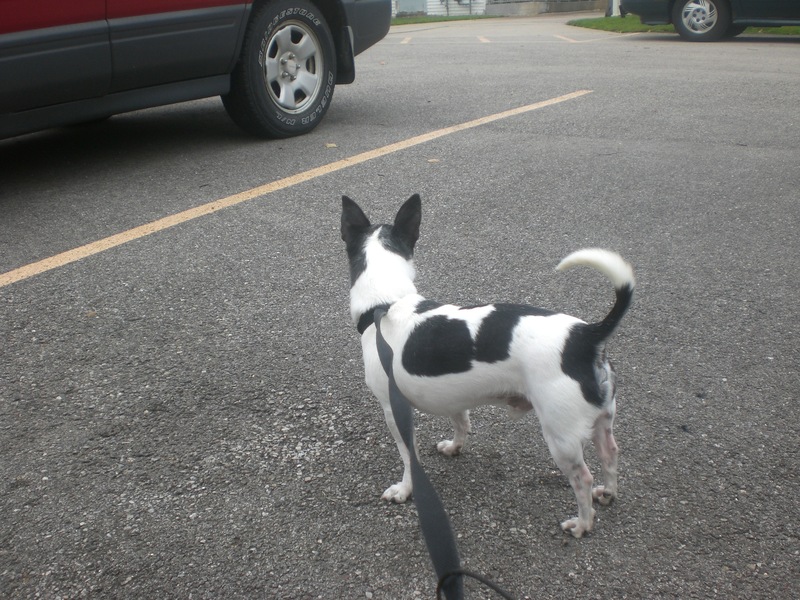 He is a one-year-old Chihuahua mix. 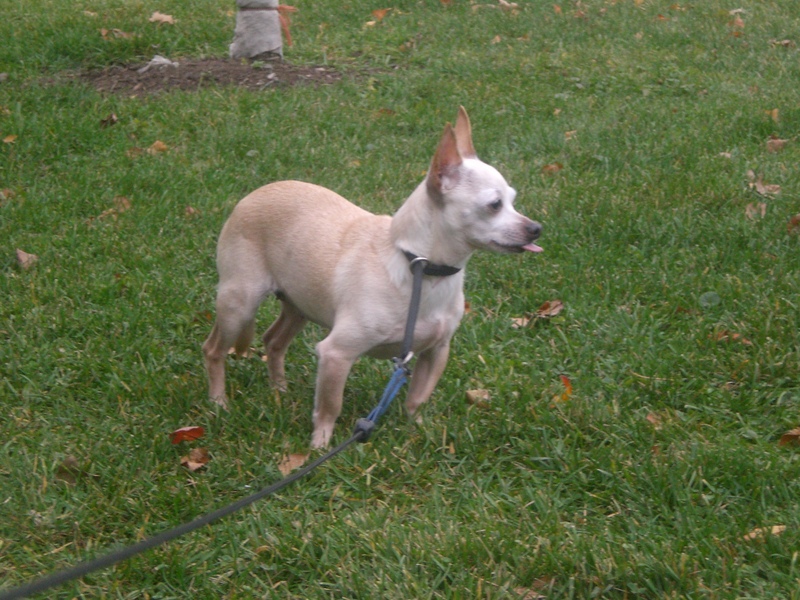 Puggie, despite his name, is also a Chihuahua mix, but seven years old. He takes a little longer to warm up to new people, but wagged his tail when he saw a regular worker approach. 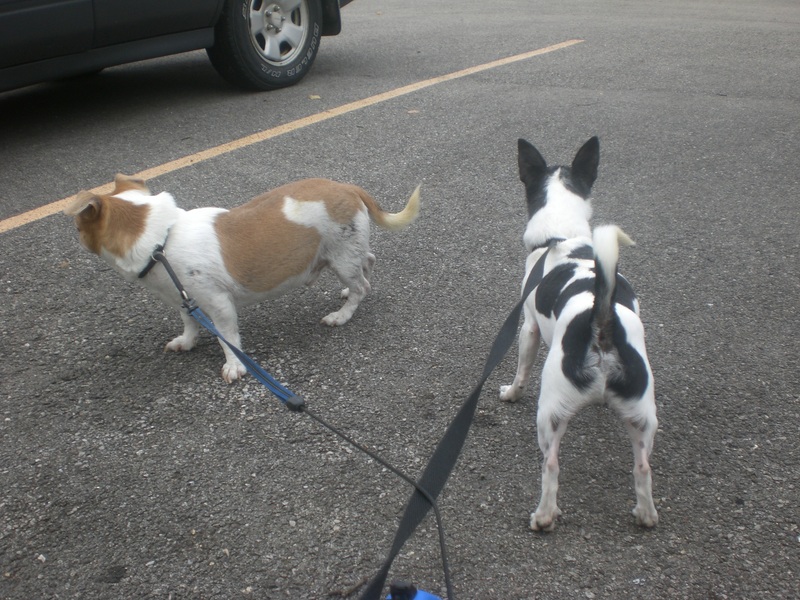 They both did well on a leash, although they could be a little stubborn about which direction to walk in (which was especially challenging when they wanted to walk in opposite directions). To get them going in the same direction, I would start to run and they would follow enthusiastically. Missy, a four-year-old Chihuahua mix, is extremely shy but sweet. I was instructed to pick her up and carry her out to the grassy area because she wasn’t too excited to walk past the other dogs who were in the outside portion of their kennels. She had no problems with being picked up by a stranger, and even put her nose towards mine as I carried her. 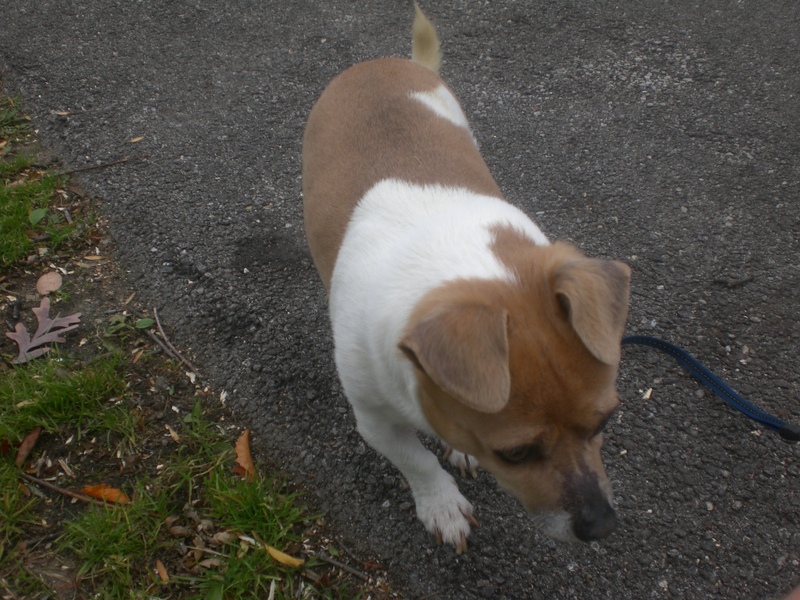 Once in the grass and out of sight of the other dogs, Missy scampered around and sniffed the ground, although she did mainly keep her tail between her legs. A patient, understanding, and loving owner would do wonders for her and help her come out of her shell. She’s a sweetie! Scratch was quite a difference, after spending time with the Chihuahuas. 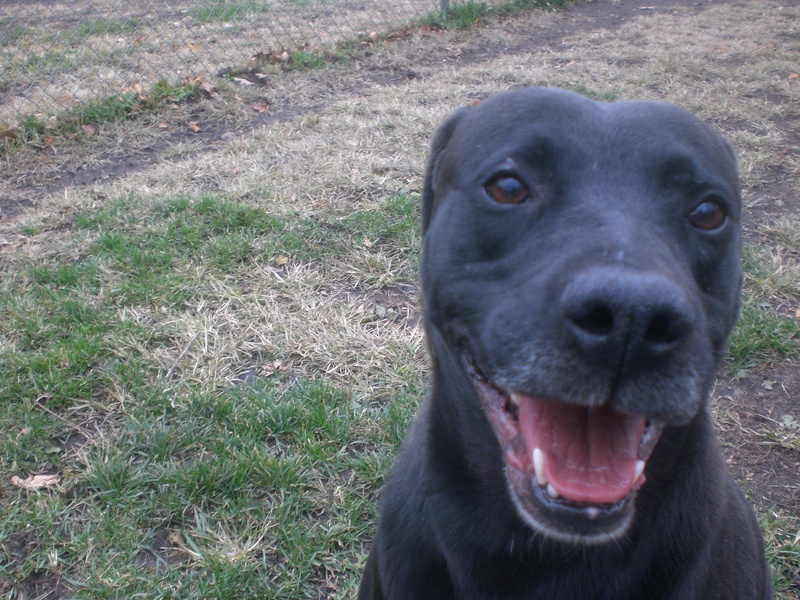 Scratch is a five-year-old Labrador Retriever mix, and true to his Lab-y nature, he was stuck to my side from the beginning. What a loyal walking companion! I didn’t have to say a word and he was walking right next to me, his side touching my leg. 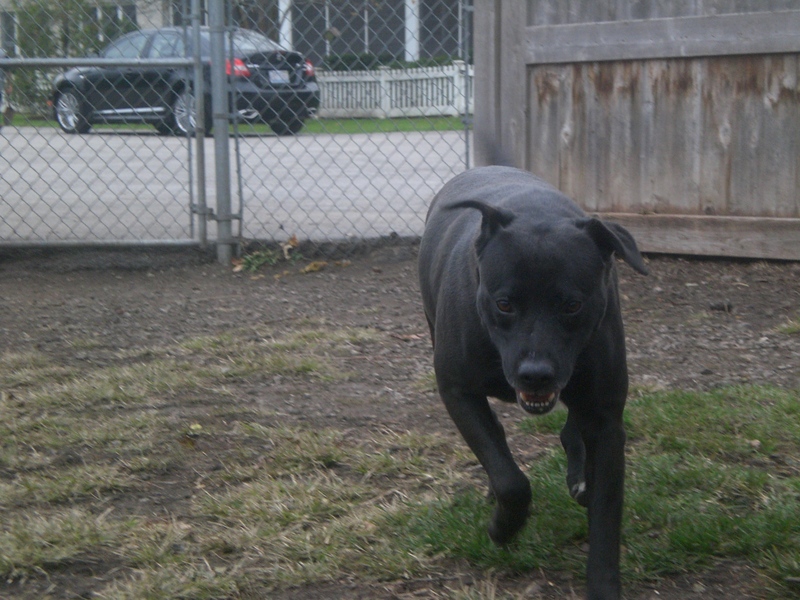 When we arrived at the run, Scratch ran around and sniffed for just a minute or two before running back to me. I knelt down and scratched his head, ears, and back. When I stopped, he looked at me and whined, like, “What did you stop for? I was enjoying that!” So, of course, I kept petting him. He is a beautiful dog, with a white splotch on his chest and some white toes. With so much love and loyalty to give, he would be a wonderful addition to any home. 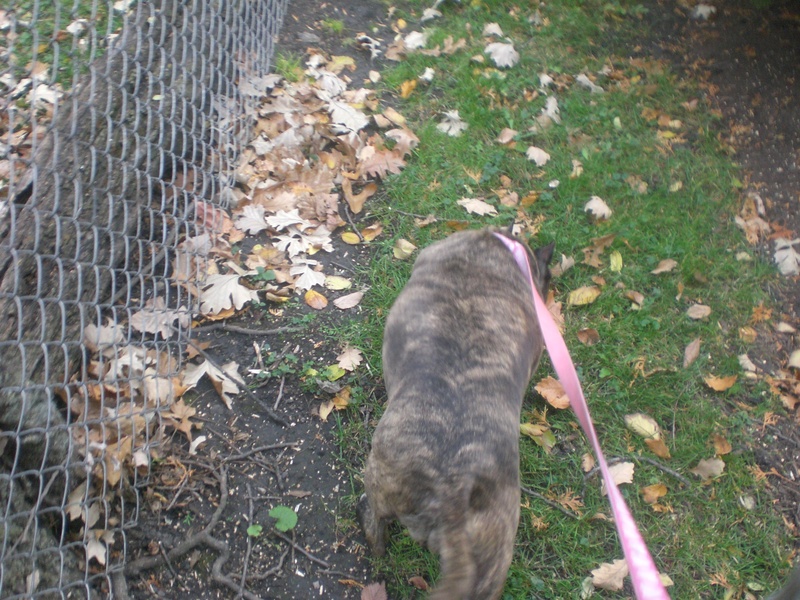 I ended my visit with Felicia, a ten-year-old Pit Bull Terrier mix. 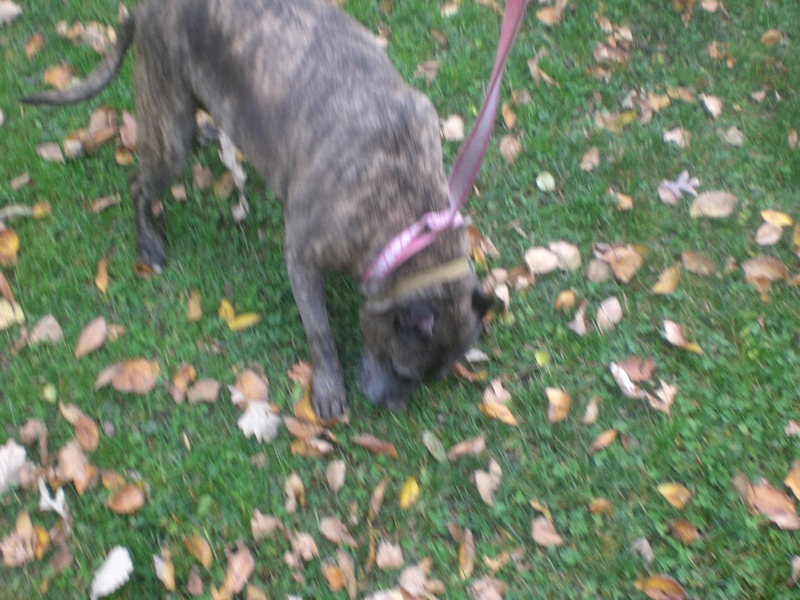 She is incredibly affectionate with people and such a pretty dog, with her unique brindle coat. I was amazed by how soft her fur is. Whenever Felicia got the chance, she would lick my face happily. At one point on our walk around the property, I sat down on a bench. She put her front paws in my lap and gave my chin multiple kisses. She has nine years of experience as a loving pet, and is looking forward to finding a new family to spend her golden years with. Do any of these dogs sound like a good fit for you and your family? Visit Orphans of the Storm® to get to know them even better! 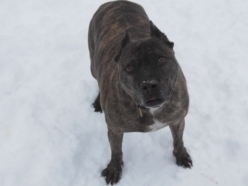 Posted by Meet the Pooches on November 8, 2011 in Dog Profiles and tagged adoption, American Pit Bull Terrier, animal shelter, Chicago, Chihuahua, dogs, Labrador Retriever, Orphans of the Storm, pets.